Basic ingredients: There is just a glass wall between you and a live, working kitchen at this well-appointed cookery school beside the Northcote’s Michelin-starred restaurant. The school, which opened in April 2014, offers a rare chance to pick up a few culinary tricks from chef-patron Nigel Haworth, who has designed many of the courses and runs the occasional masterclass. Day-to-day running of the school is the job of Michael Vanheste (previously of Betty’s Cookery School in Harrogate) who has cleverly programmed iPads with all the class recipes for use during lessons. There is a range of courses to suit varying abilities, from half-day courses such as Steak! and Mastering Macarons (£120 each), to regular full-day courses such as Dinner Party Secrets, Beginners’ Breadmaking and Classic Northcote at £195 each. Masterclasses in seasonal cookery and barbecuing are taught by Haworth himself and priced at £250. There is bang for your buck and plenty of the famed Northern hospitality to boot. A typical day starts with light breakfast and refreshments, lunch with wine, an afternoon tea followed by recipes and leftovers to take home. They say: This really is a unique and intimate experience learning new skills and dishes with the opportunity to watch through the glass front all the theatre of a Michelin star Kitchen. 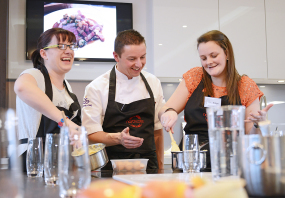 The courses are perfect for people new to cooking or for the enthusiastic cook. We say: The Northcote has a dedicated teaching style – classes are limited to eight people, ensuring attentive tuition, and the skills and knowledge acquired clearly outlined. Those wishing to gauge if they are at the foundation, intermediate or advanced stage of cookery will find the “experience level” descriptions very handy. The only downside of a day in the Northcote Kitchen that we can see is that you are likely to be too full to stay on for dinner afterwards!